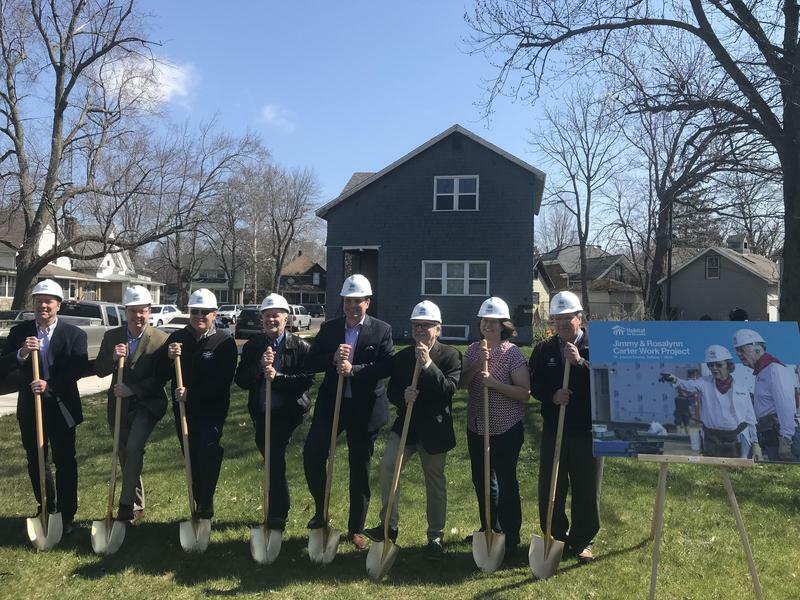 Near Northwest Neighborhood and Habitat for Humanity of St. Joseph officials break ground for four new homes associated with the August&apos;s Jimmy and Rosalynn Carter Work Project build which will take place in August. St. Joseph County, Indiana Habitat for Humanity is counting down for the start of the 35th annual Jimmy and Rosalynn Carter Works Project during the last week of August. The non-profit hosted a “Kid’s Day” Tuesday for those moving into new homes to mingle with future neighbors. Jim Williams is the President and CEO of St. Joseph County Habitat for Humanity. He stands under a pavilion at Potawatomi Park in South Bend, as he tries to avoid a collision with kids present for the ‘Kid’s Day’. He says events like this help build a sense of community for those in the program. The thing that is so motivating for us at Habitat is when we can see these families and say, you know what, this is going to make such a difference in their life, not just for one year, but for 10, 20, 30 years. Williams says one of the biggest misconceptions St. Joe Habitat frequently faces is the idea that they give houses out for free. He says nothing could be further from the truth because of the way the program works. Habitat is founded on the principal of “sweat equity,” or the 250 hours of volunteer work homeowners put in with the program, either working at the Rehab Store or helping others build homes, in order to qualify for housing themselves. This is after they’ve been accepted through an initial paper application. Prospective homeowners also have to take classes on topics that range from finances to general home maintenance. Williams says the time spent volunteering with Habitat makes the program more personal for those in it, and gives them pride in their work. “You can talk about statistics, you can talk about building a physical house, but when you look into the eyes of this kids, and you look at a parent, describe getting into this program, and you see tears running down their cheeks, there’s an emotional aspect, as well as a statistical community aspect,” Williams said. Cleora Taylor from South Bend is one of those parents who tears up when she talks about her experience with Habitat. She doesn’t cry when she’s interviewed because she says she’s starting to practice how to keep her cool in front of cameras, since she’ll get to work on her house with the former president and first lady. But every now and then, her eyes get big and glossy and she has to wipe away a tear. This usually happens when she talks about her four kids, or how lucky she is to be a part of Habitat. Taylor says she didn’t know the program existed until she saw it on TV one day. “And I [saw] the president and Garth Brooks on TV and I was like whatever family gets those houses is going to be lucky, I didn’t even know something like that existed,” she said. Taylor says she applied for the program with a couple of friends, and began to worry after they received letters that their applications had been denied. She says when she did find out she was accepted, she was at work and completely broke down. “It’s overwhelming to see how much love and support the community has for the project,” she said. Taylor says all of the support from St. Joe Habitat, like the classes she’s had to take over the course of a year have been worth it. She says high rent has affected what she’s been able to provide for her children. I want them to have different opportunities than I did and show them that there is a different way. Taylor giggles when the conversation circles back to the Carters being a part of the build, on her house. She says she has not thought about what she’ll say to the former president, but she’s been preparing. “I definitely [have] been working out twice a day, because I feel it’s going to be super national, I cannot be on TV looking a mess, even though I’m going to have a hard hat on,” she said. More than 30 homes will be available through St. Joseph Habitat for Humanity in Mishawaka and South Bend this year. For more information regarding the program, or the 2018 Carter Works Project, please visit H-F-H-S-J-C dot org.